My name is Manju Arya. I think I am 64 years old. My mother died when I was one and then my father married again and went away. 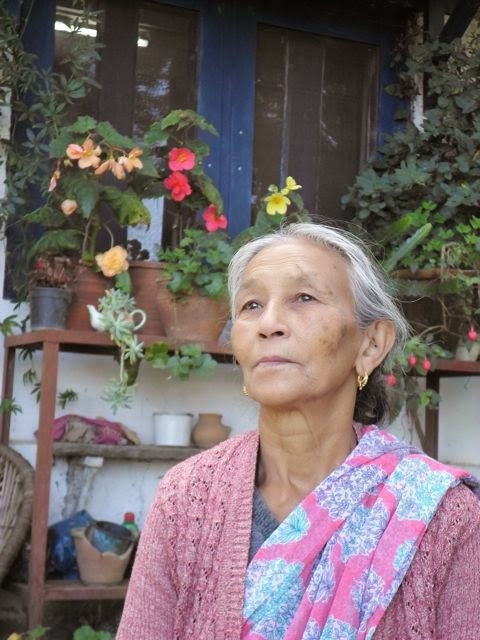 My grandmother, my father’s aunt, brought me up in her house in a village near Kathmandu. She was not rich but she gave me laad-pyaar (affection), and did not make me go to school because I didn’t want to go, and by the time I was older I was too shy to go. I played in the rice fields near the house all day and when the dhaan (paddy) came from the fields I took it to the chakki (flour mill) to get it threshed. That was my work. The rice was enough for us for the year. We ate rice for all our meals. When my grandmother died, those days ended and I had to live with my father and his second wife. I eloped at sixteen. My husband was the valet to the Ambassador of India in Nepal. He travelled all over the world for his work, to Belgium, to America, to other places, and he says he loves Belgium most and after that, Ranikhet. My husband is from Garhwal and the marriage was frowned upon by my father and stepmother. They didn’t speak to me again for many years. At first when I came here to Ranikhet with my husband—I think it was early in the ’60s—I was quite scared of the jungles around this house and the people whose servant he was. But one day I was doing something and I heard Memsahib shout for me loudly. From the garden of the main house, she was waving towards me with hands glued up with wet flour. I ran up to help her. She had been trying to show the khansama (cook) how to make something out of a book and because he was slow, she got impatient and put her hands into the dough but it was so sticky she couldn’t clean herself. Memsahib could get very agitated very quickly. I cleaned her hands and then kneaded the dough. No, of course Memsahib didn’t know how to cook and she never cooked. But she had a cookbook in a foreign language and after that day she called me more and more. She would sit on a stool and read from the cookbook to herself and then tell me in Hindi what it meant, what the processes were. In this way I learnt to make tarts, cutluss (cutlets), chicken rosht (roast) and puteen (pudding). Some things I learnt I didn’t like to do: for example putting sharaab (alcohol) into puteen. I can make thin pancakes and also bread. I make soups out of khatta ghaas (wild sorrel) that grows all over the hills and in the monsoon I hunt for junglee tulsi (wild oregano) to put into food. Chicken I cook with rosemary—rosemary bushes work as short hedges around our house. In her salad sometimes I added the leaves of nasturtium, the orange climber-and-creeper which flowers even through cold December. We had no oven and no special pans so I made the tarts on a dekchi (cooking pan) lid and baked them on a chulha (wood stove). For breakfast, when it was in season, I would give Memsahib strawberry—there was a small patch in the flowerbeds in those days—and malai (cream) from the milk. Sometimes we bought cream from the Military Dairy. There were always more strawberries than she could eat, so we also tasted them. Now the patch is dead. In our own home we eat daal bhaat (dal-rice) in the morning every day. Memsahib, all her life, gave us two kilos of chana daal to cook every month. In those days it was the cheapest daal. In winter we might have rotis made of madua (millet) which is very warming and bhatt ki daal (black soya broth), which is also warming. When it’s cold, the children pluck big lemons from the tree and get maltas (oranges) from the market and then make the pulp into chutney with dahi and chilli and then they eat it all in the sun. It’s too sour for me these days. When it snows my grandchildren run about playing in the cold and pick up lumps of clean snow to mix with gur and eat as ice cream. If I ever brought leftovers home from Memsahib, nobody would eat them but my husband and me. My children think all that English food is tasteless. They don’t like anything that is not chatpata (tangy). I’ve slowly started to like soups. I also like tuna, and omelettes with cheese, and coffee. My children don’t like any of these things. My youngest grandchild begs his mother each time she goes to the market to get her just one aloo tikki (potato cutlet), on the sly. But her mother says she can’t do that. There are too many children in the house and we can’t afford aloo tikkis for all of them, except occasionally. I tell them I’ll make you tikki at home, but they say it’s not the same thing. We’ve never eaten out in a restaurant to fill our stomachs—but if we are stuck in the bazaar long past mealtime then we might eat a samosa or a tikki. One day my granddaughter, who has a new job, took me to eat at Rajdeep Hotel in the bazaar. We shared a plate of chowmein. It was expensive, twelve rupees for that plate. But youngsters want these things, like noodles. They always want Maggi noodles in their tiffin. Look at the tea shops in Ranikhet now: they all cook Maggi noodles and sell it as a snack! The children want ice cream, they want cakes with cream. All these things are too expensive for us. But for their birthdays we buy a small cake and I make chhole (chick peas). For some special days we cook mutton or chicken curry. Earlier when we bought mutton the butcher would know from the small amount that it was for our own use and would always give us pieces of scrap and gristle although we were paying the full price. If we bought bread we would always find we had been given a stale loaf, sometimes with fungus. My daughters, who are very smart, began to tell the shopkeepers they were buying for Memsahib and then they got better quality. My daughters will never be servants like I have been all my life. They are all BA pass, they have different ideas. I have lived in Bombay with Memsahib also. All along the wall in front of our house there were a line of stalls selling dosa and paav bhaji (bread and vegetables). Early each morning the stall owners would start chopping kilos of onions and coriander and peeling potatoes and then cooking. Then, at lunchtime all the office-goers would crowd the stalls. I had never eaten a dosa before. They had great big tavas (griddles) on which they would spread the batter really fast and bake them golden and crisp. I could smell their sambar (spicy lentil curry) from the balcony: it used to make my mouth water then and even now, I love eating sambar. My middle daughter has learned to make it. We pluck curry patta (leaf) that grow wild near Ranibagh, on the way up from Kathgodam, and dry it and store it. We can now buy sambar powder in the market if we want to. I always say, if you have money, you can buy anything in Ranikhet these days! In those days, in Bombay, I would stand at the balcony and watch them stirring the sambar and turning out heaps of white idlis. Then after the lunch-time rush was over the vendors would clean up, and in late afternoon, go nearby to buy a piece of fish each for themselves. They’d cook it with a lot of masala and in the evening they would have their one meal of the day with great relish--fish curry and rice. The owners of the bungalows near these vendors would be very annoyed by the crowds and cooking smells, and would try to chase them away, but I could not stop watching them from the upstairs balcony everyday. I have never returned to Nepal. I was not welcome in my father’s house. I don’t even know what happened to my stepmother, but I know my father is dead. One day a Memsahib from Nepal brought bhogta (grapefruit). I had never seen it since I left the country. When I cut it and saw the pink flesh inside and smelled it, my home came back to me--the fields in the village near Kathmandu. I have kept the seeds and planted some of them. They’ll fruit one day. I liked the last line .... "They'll fruit one day" !!! !